I recently got a set of Cretacolor pencils, and I wondered how they fared against Derwent's Onyx pencils. To make the comparison fair, I pit Cretacolor's Monolith Woodless pencils against Derwent's Onyx pencils because they're both graphite. Cretacolor's Monolith uses graphite formed into a 7 mm solid stick with a protective lacquer coating. Derwent's Onyx comes in two tones, medium and dark, but it is easy to build up darker shades if you need them by increasing the pressure. 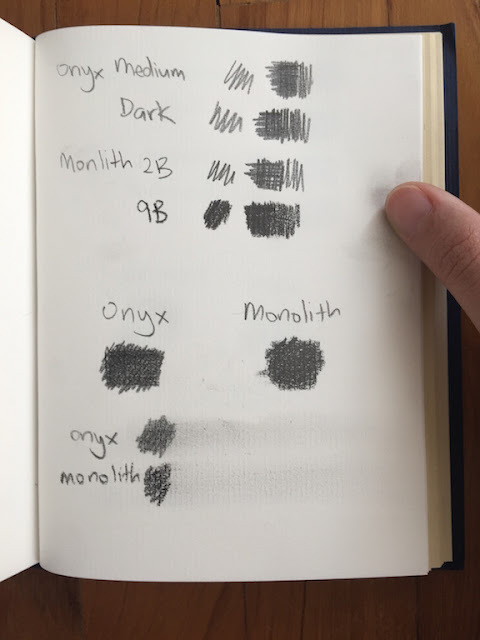 I did a basic swatch test for each of the pencils; then I tried going as dark as I could with the dark Onyx pencil and the 9B Monolith pencil; and finally, I did a smudge test. I think the Onyx Medium and the 2B Monlith pencils are comparable, but the 9B Monolith pencil is ever-so-slightly darker than the Onyx Dark. They're all wonderful pencils, though, so I guess it's really down to availability, and personal preferences.